Introducing the PureSpa Jet Massage Spa Set by Intex, this elegant looking Spa Set is highly well equipped to make it one of the first choices of anyone that's looking into buying a professional grade Hot Tub that is also portable. The 4 High-Pressure water jets can be adjusted at your desire, from the control panel giving you, as the user, full command at the touch of a button. If you are looking for an honest review for this PureSpa Jet massage, you are in the right place. Here I am going to give a detailed review about the product. Durable Construction: The PureSpaJet Massage Spa Set by Intex comes in a very elegant black color with white interior. Designed from three-ply laminated materials using Fiber-Tech Construction.The PureSpa Jet Massage Spa Set is made to be puncture resistant to provide the ultimate comfort, durability, and support. The inner and outer measurements while inflated are 57" x 77" with a height of 28"; this is enough for an outstanding water capacity of 210 gallons. The seating capacity is also very reasonable, 4 people can enjoy comfort and room to spare a relaxing Hydro Massage. Initial set-up takes about 20 minutes to put everything together and inflate using the air pump that comes with it and another 30 minutes to fill it up with water. A good tip is to use a water source that provides warm water as it will speed up the process and you will be able to enjoy a warm and relaxing hydro-massage much quicker. Ease of Use: No need to be tensed about the using process of this spa set. Any new user can start to use this spa set with a few instructions. Comes with user-friendly control panel activates the four high quality and performance high powered and adjustable water jets for a relaxing massage. The heating system can also be managed by the control panel, which gives you the possibility to adjust the water temperature as you desire, at up to 104 degrees Fahrenheit. The hard water electronic treating system filters the water, so you can enjoy a refreshing and relaxing massage. The hard water treating system also helps the water pump, thus increasing the life of the Hot Tub. When you're finished with the massage make sure to put on the insulated tub cover that comes with it.It's going to help with heat loss and keeps unwanted debris from going inside the Hot Tub. Suitable for Vacation: Also if you're planning to go on vacation don't forget to take the PureSpa Jet Massage Spa Set with you. The carry bag that comes with it makes it easy for transport and storage. Intex also offers at a separate charge, of course, a cup holder and a headrest, both at a very good deal. Along with the above in the package, you will find the filtration system which includes 2 filter cartridges, a floating chlorine dispenser, thermal ground cloth the inflation hose and test strips. Compare and contrast: The PureSpa Jet Massage Spa Set by Intex is in a league of its own. Featuring 4 high-pressure water jets make it far superior to other in its range in both comfort and efficiency. Because the air is heated before being pumped inside the Hot Tub, this helps with heating performance and the level of relaxation, since you can enjoy a warm hydro massage bath without getting cold. The maximum temperature can get to is 104 degrees, but this is a safety feature that all inflatable Hot Tubs must respect. The good thing about the PureSpa is that it gets there much faster than other Hot Tubs in this range. With most inflatable Hot Tubs you get all kinds of surprises starting from heating issues if the weather outside is cold or that the massage is not so great. With the PureSpa you will not have this kind of issues. It does what it's supposed to do and it does it very well. Suitable to All: The PureSpa is fun for the whole family and not just that, business owners can take advantage of it as well. Kids love to lay in the water with their toys, it keeps them entertained for hours in a safe environment and it also helps them boost their imagination. Parents will love this when everyone else goes to sleep or when the kids are on holiday with their grandparents, they can enjoy some time with the spouse in quiet, with a relaxing hydro massage. Because it comes with a carry bag it's perfect for students as it can easily be taken with them anywhere they go. If you are a hotel resort owner and you are new to the business or you just don't have enough room to build a pool for your customers, the PureSpa's professional and luxurious look will help you delight your customers with a relaxing Spa at the fraction of the cost. Elders will benefit from the 4 high-pressure water jets a lot, the warm and relaxing sensation that it offers, help greatly with the pain of old age. Large Water and seating capacity, with 210 gallons of water, 4 people can enjoy at the same time. The beautiful color makes it look premium quality and it will look great anywhere you want to place it. The PureSpa by intex offers 4 high-powered jets that are placed in the interior walls for a relaxing massage. PureSpa heats up the air before pumping it inside the Hot Tub the water is heated up much more effectively. The pump is quiet, unlike most inflatable Spa Sets. The heater works very well, it's fast and stable since it doesn't get cold air from outside. The price of the PureSpa Jet Massage Spa Set makes it a bargain if we are to compare what you get for what you pay. Very easy to set up, just use the air pump that comes with it to inflate, you will not need other tools. Taken from other users opinions, 4 people can't really fit in, probably it depends on how fit you are. But this seems to be an issue with all Hot Tubs. A few users have also reported that after about 1 year the structural integrity starts to weaken and either water leaks out from the bottom or air escapes out through the surrounding area of the water jets. In conclusion, I must say that you must give it a try, or at least consider buying. 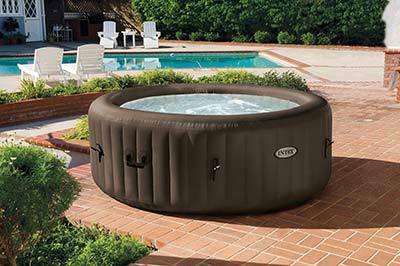 It's one of the top choices when it comes to inflatable Hot Tubs, almost comparable to the professional Hot Tubs that cost thousands of dollars.The PureSpa can offer you a luxurious and comfortable experience at the fraction of the price. Thanks to its 4 high-pressure water jets that can be adjusted to your desire from the control panel gives it a high advantage against Hot Tubs in this range. If you are looking into buying a new Hot Tub for your family or business make sure to give this one a try.